The Budget of the new Yahapalana Government for 2016 was presented by Minister Ravi Karunanayake in Parliament last week. 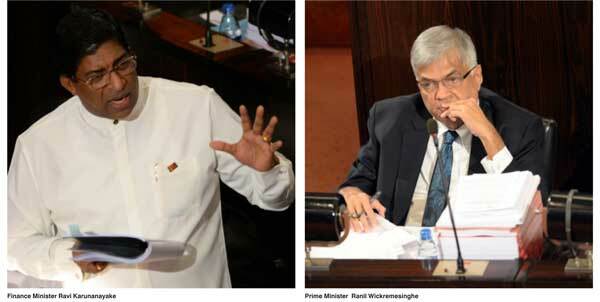 This budget follows the economic policy statement or EPS delivered by Prime Minister Ranil Wickremesinghe in Parliament a few weeks back. The EPS, while admitting the perilous state of the fiscal sector of the country, had vowed to discipline the budget, introduce economy wide reforms, convert the country’s simple production system to complex production, generate wealth through linking the country to a wider global market and address the need for security for the old-aged and vulnerable groups. Since the Government’s economic policy package is to be implemented through Government machinery, it is necessary that the Government budget be aligned with the overall policy of the Government. The EPS had made one important diagnosis before it went to setting goals for disciplining the imprudent fiscal sector. That was that Sri Lanka had been living for years beyond its earnings. This reference was in fact valid for the public sector rather than for the private sector. That was because the private sector had factually lived within its earnings throughout. If it had earned Rs. 100, on average, it had spent on consumption only about Rs. 82, generating savings of about Rs. 18 for the nation for reinvestment in productive assets. The public sector, on the other hand, had been spending on consumption Rs. 102-Rs. 103 when it had earned Rs. 100. Thus, the notorious public sector had been borrowing even for maintaining its consumption expenditure programs, which are ballooned year after year through politically popular free handouts offered to people. 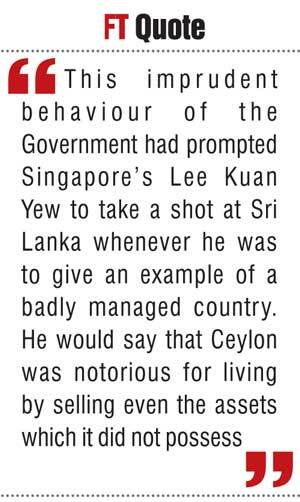 This imprudent behaviour of the Government had prompted Singapore’s Lee Kuan Yew to take a shot at Sri Lanka whenever he was to give an example of a badly managed country. He would say that Ceylon was notorious for living by selling even the assets which it did not possess. Accordingly, the curative procedure for the ailment from which Sri Lanka was suffering had to be started by disciplining the budget. Thus, the EPS had announced two quantitative and several qualitative goals for the fiscal sector. One was that the budget deficit be reduced to 3.5% of GDP from the current high level of about 6-7% of GDP by 2020. Another goal related to changing the tax structure which had heavily been skewed toward indirect taxes. Thus, the EPS had set as a target to reduce the share of the indirect taxes in the total tax revenue from 80% to 60% and increase that of income taxes from 20% to 40% over the medium term. Budgets in Sri Lanka, in the absence of an effective monitoring mechanism, had always been ‘a numbers game’. It has been the practice of the Ministers of Finance to announce impressive budget numbers to Parliament when the budgets are presented. However, these budgetary numbers are never monitored either by Parliament or civil society organisations, though a mechanism for such evaluation has been provided by the enactment of the Fiscal Management (Responsibility) Act of 2003. The Minister is also required, in terms of the Act, to explain any departure from the stated fiscal objectives and present strategies which he would adopt to return to those objectives. However, in practice, the statements issued by Ministers of Finance had been eulogies made about themselves and the success of their economic policies. Though this was the game plan played by Ministers of Finance neither the Parliament nor civil society organisations took the Government to the task on this count. Hence, the rosy budgetary numbers presented in Budgets were always missed, with no concern about their disastrous impact on good governance or the credibility of the Government. The final outcome of the interim budget presented to Parliament in January 2015 is a case in point, though the observations made are valid for all the previous budgets. The interim budget had a revenue target of Rs. 1,535 billion or 13.6% of GDP. The provisional numbers say that the Government raised only Rs. 1478 billion or 13.1%. Similarly, the Government’s consumption expenditure, also known as recurrent expenditure, had been budgeted at Rs. 1552 billion or 13.7% of GDP. But the provisional data show that the consumption expenditure had overshot to Rs. 1648 billion or 14.6%. The rosy budget had estimated a small deficit in the revenue account amounting only to Rs. 47 billion or 0.4% of GDP. But the actual deficit had amounted to Rs. 180 billion or 1.6%. This was evident in the overall budget deficit too. According to the Budget, the overall deficit was to be restricted to Rs. 490 billion or 4.4% of GDP. But, at the end of the year, it had shot up to Rs. 675 billion or 6.6%. Accordingly, all the interim budget numbers had been missed except those relating to the Government’s capital expenditure which had better performed by a small margin. With these types of outcomes relating to Government budgets, it is misleading to evaluate them on the basis of mere budgetary estimates. A meaningful evaluation should be made only at the end of the year when actual numbers are available. But, that would be a post-mortem serving only as a fault-finding exercise. Hence, budgets should be evaluated not in terms of numbers but on the basis of the soundness or otherwise of the proposals made in them. In the case of the current budget, a useful evaluation would be to examine its alignment with the economic policy statement announced by the Government. The Budget 2016 has announced that it is based on the medium term economic strategy of the Government as outlined in the EPS presented by the Prime Minister to Parliament. These strategies, according to the Budget, encompass the following areas: Generating of one million employment opportunities; enhancing income levels; development of rural economies; ensuring land ownership to rural and estate sectors, the middle class and Government employees and creating a wide and a strong middle class. But these are just goals pronounced in the EPS and not the strategies outlined therein. The main strategy for creating wealth, employment and prosperity has been to promote international trade and link the economy to the rest of the world as it had been in ancient times. This underscores the promotion of exports, especially the high tech exports, by producing, as the EPS had pronounced, for a market bigger than the local economy. The main policy thrust would be placed on reforming the educational system to produce quality manpower, promoting research, technology and innovation and enhancing competitiveness. The leadership in promoting the economy would be taken by the private sector and not by the state sector. When the Budget 2016 is evaluated on the basis of the goals and strategies enshrined in EPS, it shows three different outcomes. Some are in line with the EPS, some are neutral and some go against the EPS. Thus, most of the proposals are either independent of the EPS or totally misaligned with it. One glaring misalignment is the failure to lay the foundation for the realisation of the overall budgetary targets in the medium term. The EPS envisages changing the tax structure with more emphasis on income taxes. It has even set a quantitative target of attaining 40% of the tax revenue from income taxes by 2020 as against the historical average of 20% on that count. This requires policies to reduce the share of indirect taxes from the present 80% to 60% over the years. However, Budget 2016 has planned to raise even a bigger share of income from indirect taxes. Accordingly, the share of the indirect taxes has shot up to 86%, while that of income taxes has fallen to 14%. Worse, it has made the income taxes regressive by applying a uniform rate of 15% on everyone earning over the threshold limit of Rs. 2.4 million. Thus, Budget 2016 has made both the indirect taxes and the direct taxes regressive which EPS had sought to avoid. Similarly, the budget deficit which the EPS is planning to reduce to 3.5% of GDP by 2020 has been raised to 6% in Budget 2016. Another deviation has been the funding of the overall budget deficit through new borrowings amounting to Rs. 1,050 billion. This measure would add to the existing level of public debt which the Government plans to reduce over the medium term. Clearly, as far as the overall budgetary discipline is concerned, Budget 2016 has moved in the opposite direction. Once a budget goes out of control, it would be difficult to revert to the correct path without causing social and political tensions among the population. Hence, it is of utmost importance to lay the foundation for eventual budgetary discipline right at the outset thereby getting space for making a gradual movement toward the final goal. Thus, the thrust of the reforms has been to create an environment for the private sector to operate freely and without impeding barriers. For that, the economy should be freed. However, some of the policy reforms and policies are to increase the size of the state sector and create more barriers for the private sector to operate. Take, for example, the proposal to establish another state university by the name of Mahapola University to pay tribute to the late Lalith Athulathmudali who created the pathbreaking Mahapola Scholarship Scheme. For this purpose, the Budget has proposed to allocate a sum of Rs. 3,000 million initially. The establishment of new universities by the state should not be done in an ad hoc manner but in terms of a national policy of promoting higher education in the country. The current challenge of the country’s higher education system is not the establishment of new universities, but the consolidation of the existing universities and upgrading their teaching and research qualities. If the Government is desirous of honouring the late Lalith Athulathmudali, the best course of action would have been to create a Chair in his name in a law faculty of an existing university or establishing a new School of Law named after him. The proposal to set up an Exim Bank with state participation to cater to the international trading sector is another misconceived venture though it is going to be a public private partnership. The Government has already burnt its fingers in the banking sector by getting the public funds to buy private banks and establishing two state banks on similar lines earlier. Instead of exiting the Government’s stake in leading private banks it is continuing with the same bad policy which has frightened the private sector. In the other example, it set up two state banks called the National Enterprise Bank or NEB to promote enterprises and Lanka Puthra Bank or LPB to fund infrastructural projects. Both these banks became bankrupt with undue political interferences which would have been the sole purpose of setting up them. NEB had mounting loan losses and could not be continued as a viable business. LPB lent a huge amount to Mihin Air which the bankrupt airline could not repay. The Treasury stealthily took over the losses of LPB and forced it to absorb NEB but it was a marriage of two sick partners. The Budget 2016 has proposed to amalgamate it with the Regional Development Bank or RDB. This would amount to making even the presently well-performing RDB sick. The Budget has found fault with the prevailing banking system for not supplying adequate credit for the micro, small and medium enterprise, known as MSME sector. But, RDB was specifically created for this purpose and it was doing an impressive job on that count, while maintaining the required level of efficiency and solvency. With the proposed dilution of its functions, it would face a serious capacity problem to move into new areas. Hence, establishing more and more state banks would simply add more burdens to future budgets in the form of having to recapitalise them when they run into problems. In this background, the government should have allowed the industry to establish the Exim Bank if it so desires to do so with its own private capital infusion and run it as a commercial venture. On the positive side, the Budget 2016 has proposed to liberalise foreign exchange by repealing the draconian Exchange Control Act and enact in its place a new business friendly Exchange Management Act. Exchange Control was introduced to Ceylon during the war times to prevent the country’s foreign reserves falling into the hands of the enemies, namely, the Germans and the Japanese. It was meant to be a temporary measure to be removed after the war. However, the independent Ceylon made it a permanent law making exchange control offences criminal activities. This gave opportunities for successive governments to use the provisions of the Act to persecute their political enemies. Hence, it is now time to decriminalise exchange control and make exchange management a market friendly activity. Those who are opposed to the measure should realise that in the neighbouring Maldives, there is no exchange control. The Budget 2016 is aligned to EPS only in spirit but not in action. The mistake made at the beginning will have disastrous effects on the attainment of the goals enshrined in EPS.